This isn’t the first time that we’ve covered the Helena De Natalio Sofi Leather Hobo but I have to say this is the version I like the most! We’ve seen the bag in black and another one in a sea green color. Both gorgeous in their own way but when I saw the latest version I said to myself, ok, I really need to get this! The Helena De Natalio Sofi Snake Embossed Leather Hobo is available exclusively at Saks and when I hear exclusivity I want it more! The slouchy snake-embossed leather hobo is soft, feminine and simply gorgeous! I am not sure if I wish the bag had silver hardware instead, but I am totally happy with the goldtone hardware and accents. The strap is adjustable and can be worn across the body or on the shoulder. I definitely think I would opt for the shoulder bag option. I love the slouchy look and feel to the bag. 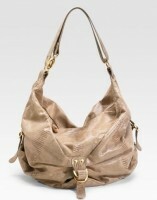 And for some reason I think the slouchy look is even better on this bag than the others; it doesn’t seem as sloppy. Buy through Saks for $550.